Software testing is an activity that can be performed as an isolated, scripted task, but it has much more value and impact when combined with contextualised thought and analysis, and followed by informed action. The same is true for interviewing. Rather than diving straight into a list of steps to follow when interviewing junior testers, you can learn how to use your own context to shape the interview process and increase your odds of a successful hire. What Does A Junior Tester Look Like? A good starting point before the interview process, and even before advertising for the position, is making sure there is an agreement on the definition of a "junior tester" role within the hiring team. Some might consider this to be anyone with less than two years of experience in a role with testing duties, while others may argue that a junior tester should have two to three years of experience in the field. Whichever term or definition you use is up to you and your company’s HR department. What’s important is that all relevant parties involved in the hiring process understand it. Once you’ve defined what “junior tester” means to your hiring team, jot down the kind of skills, knowledge, and experience you would expect someone to have in order to be a successful junior tester at your company. Context matters. Picture what a good tester looks like in the environment this person will be stepping into. What specific tasks/projects will they be working on? What kind of training and support will be available, and for how long? Will they be working alone, or in collaboration with colleagues; within their own team; co-located or across different offices? What other duties will they be expected to perform? It might be helpful to use mind maps to visualise which characteristics are needed for particular aspects of the job. You might discover that different skills or qualities are needed to thrive in these environments than what you’d previously thought. Consider whether it’s fair to expect a junior tester, as you’ve defined the role, to possess all these qualities and handle all these situations, or whether a more experienced tester is needed. After your team has determined what they think an ideal junior tester candidate should be, it’s time to categorise the skills, knowledge, and experience needed for the role: essential versus desired, teachable versus non-teachable. It’s important to be honest and realistic about what you can or can’t do without, and what you think someone will be able to learn with time and guidance. Get this wrong, and you could be looking for a mythical candidate, or end up with someone who will never really be capable of achieving your expectations. Plot out each characteristic in a diagram, or “quality quadrants”, like the one below. This is just a basic example to get you started. Remember to make yours specific to your context, and adjust the grid as required. What must the candidate be able to demonstrate from the outset (essential, non-teachable)? Are there any essential skills you’re happy for them to prove during the probation period (essential, teachable)? What desirables can be learned over time (desired, teachable)? What natural qualities would really set a candidate apart from the rest (desired, non-teachable)? 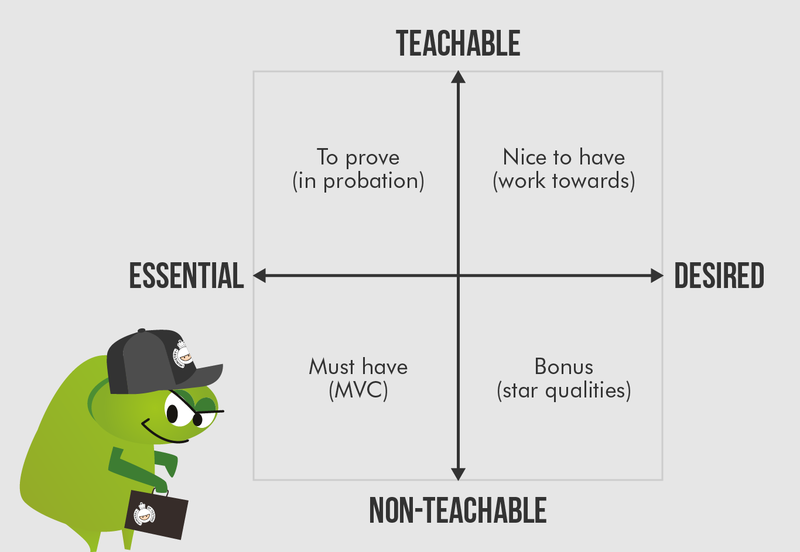 These points are the acceptance criteria for your Minimum Viable Candidate, plus a few bells and whistles you’d be happy to see thrown in. This plotting technique will help to establish which points you should focus on in the interview, and where training and support can be offered to the successful applicant. You can also use this grid as a reference to help compare candidates after interviews have been conducted. Time For A Sanity Check! Do the characteristics match what other junior testers started with at your company? Could a great candidate be successful without one or two of the “must have” qualities? Would you have been happy interviewing for a junior position with these expectations? Refer back to this tool if the team starts struggling to find someone that meets all the requirements. You might have to re-think whether your expectations are realistic. Once you know what you’re looking for in a junior tester, start thinking about testing the tester. You’ll need to decide what to interview for, and how best to do it within the time allocated for each interview. You should also think about how to bring out the best in candidates and avoid anything that might lead to discrimination. 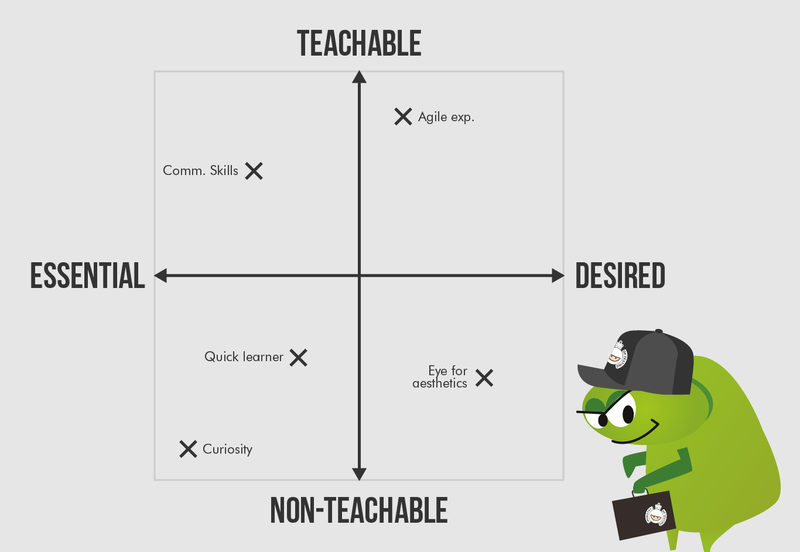 Look at the characteristics on your quality quadrants to check which are the most important to interview for, keeping time constraints in mind. If you have a long list, you might not be able to ask questions or set tasks that cover everything. How have you tried interviewing for these criteria in the past? Can you think of any instances where a successful candidate ended up not possessing the skills and qualities they seemed to demonstrate during interviews? If so, you may want to pay special attention to these this time. How did you find out they were lacking? Drawing from real examples should help you think of some ways to interview, or test, for important factors. How do existing testers in the business demonstrate these qualities? Try brainstorming with current tester groups to find out about their best and worst interview experiences, and ask how they might conduct interviews. If you’ve collected feedback from past interviews, use this to take deliberate steps towards improvement. If not, recommend collecting feedback for an interview improvement process and ask for candid feedback from your current team so you know what to improve, and what to repeat for the next round of interviews. For more interview inspiration, check out this post by Dan Ashby, which is a favourite amongst many testers when they need questions or advice for hiring new talent. You can watch a webinar about it as well. I’ve also put together a list of interview techniques and tasks for testers, with some pros and cons of each. If tasks are part of the interview, try to make them as realistic as possible so a real working environment is reflected. This will be helpful in setting candidates’ expectations about the work they will be doing if they join the company. It’s also a good opportunity to ask candidates to “think out loud” and gain insight into their thought processes, as opposed to focussing purely on the “answers”. If you ever wondered what led a candidate to a particular conclusion or action, this is a great solution. If you plan to ask odd or abstract questions during interviews, let candidates know you’re not trying to trick them by letting them know the reason behind asking a particular question. Candidates for a junior tester role might have limited interview experience, and therefore could be more easily thrown off by seemingly strange questions. Revealing the purpose of your questions can give them focus. Verbal assurances like, “don’t worry, take your time,” or re-wording the question can be further help towards candidates performing as best they can. It also gives them a positive perception of the kind of people they might come to work with. Remember those qualities listed under “essential” and “teachable”? If a candidate struggles to prove that they possess these qualities during the interview but ticks all the “must have” boxes, perhaps they can better prove these skills to you during their probation period, under less intimidating circumstances. If this seems too high a risk, consider having another call with the candidate before making a final decision. Resist the temptation to write off a potentially fantastic junior tester due to a case of nerves. It’s against the law in the UK to ask candidates about protected characteristics (such as marital status, gender and religion) during the recruitment process. Make sure interviewers are informed about the type of questions they are to avoid. If the company collects this kind of sensitive information to monitor workforce diversity, it’s essential that this is done on a separate form, and that no one involved in the recruitment or selection process has access to this information. Candidates are not required to provide these details, so make sure they know that any details they do or do not supply will not affect their application. You can find out more about preventing discrimination in the UK on the gov.uk website. Always check the guidelines and regulations that apply to the country and location where the interviewing is taking place. The recruitment process doesn’t just let you find the best candidate; it also lets candidates find the best company. Good candidates always have options, and forgetting this is guaranteed to lose you a few, so make the candidate experience as positive as possible, from the advert, to the offer, and beyond. Typos in your advert make an immediate bad impression and can deter some candidates from even applying. Make sure all adverts, forms, and other communications are spell-checked, proofread, and well-formatted. Don’t give anyone the chance to make jokes about how someone should have tested your advert. One bad interaction can sour the whole experience for candidates. Make sure everyone in the office knows when a candidate is coming in for an interview and create a friendly and inviting environment from the recruiter (both external and internal), to the receptionist, to the interviewers. Even a colleague walking past in the waiting area can impact a candidate’s perception of the company. How interviewers behave during an interview can leave an impression with candidates, and could incorrectly form ideas about what they could expect after joining the company. Negative comments about clients or projects, offensive remarks, and even lack of eye contact can give a bad impression, so be aware of your actions. There are lots of tips out there for candidates on presentation and body language that interviewers can also benefit from. Take time to remind yourself of the basics. There are many ways to demonstrate the real company culture. Ping-pong tables and beer fridges are short-term seduction tactics that can be found in many other offices, and may not be as attractive as you might think. Small gestures like offering candidates a drink, showing them where the toilets are located, and taking breaks (especially for longer interviews), are very simple ways to show that you care. Are staff often expected to work late, or encouraged to get home to their families? If overtime is needed, how is the team thanked? Does the company run knowledge sharing sessions or host industry meetups? Is there a scheme for childcare vouchers or other support for working parents? These kinds of details will really reveal the day-to-day culture and set your company apart from the rest. Consider giving candidates time to have a confidential chat with someone who isn’t involved in the hiring process. This gives candidates a chance to ask more delicate questions, and feel more confident about the answers, without having to worry about what impression those questions might give the hiring team. The work to hire a junior tester doesn’t stop at interviewing. You’ll also need to give feedback, put together a good offer, and keep in touch until the candidate walks back through the door as your new colleague. Before each interview ends, tell candidates what the next steps will be and when they can expect to hear from you. Always try to contact candidates with feedback within the time advised. This shows that you’re serious about hiring, and respect the applicants. Maintaining a practice of being prompt with feedback gives your company a better chance of securing the desired candidate before someone else does. Even if someone won’t be progressing to the next stage, do them the courtesy of letting them know, and give constructive feedback that will help them with other applications. This person might be a great fit for a position in the future, or could refer someone who is, based on the feedback and respect they were given as a candidate. If making a decision takes longer than expected, keep candidates updated so they know you’re still interested and haven’t forgotten about them. Many companies don’t do this. The very small gesture will earn your company valuable brownie points with a prospective candidate. When it comes to making an offer, honour a candidate's worth to avoid losing out to another company who isn’t afraid to award a candidate with a competitive package. A package should include details of the basic salary, bonus, training and development fund, tech set up (choice of laptop, etc. ), holidays, insurance and health benefits, and more. The best candidates will consider the whole package, not just salary. Don’t fall into the trap of dismissing this as “just a junior position” or assuming that less senior candidates will take whatever is offered. If this person is as good as you think they are, they will progress quickly and have other, better, options. A low-ball offer is extremely demoralising for any candidate and could leave them wondering how you’ll treat them further down the line. Being less likely to have experience of negotiating a package, or simply having less confidence to do so, junior testers, or junior candidates for that matter, are more likely to accept a better offer from another company than to ask your company to revise theirs. By that point, you’ve already shown what you thought you could get away with offering, which could leave a sour taste for a candidate and could damage your company’s reputation. It’s not worth playing games. When presenting your offer to the successful candidate, explain how your opportunity will give them the experience they need to learn and develop in areas where they’ve shown an interest. This shows that you’ve been paying attention and will really help your company stand out as one that values and invests in their people. If all goes well and the candidate accepts, keep in touch before their start date, as there is still time for another company to jump in and make another offer. Make sure a successful candidate has everything they need from you. Be open to any questions they might have, and remain warm and sincere during the onboarding process. If a candidate receives another attractive offer before starting with you, they’ll be more likely to have a discussion with you about it than back out unexpectedly if communication is maintained. If this happens, be understanding, and recognise that they’re in demand. Listen to what the candidate has to say before trying to convince them to reject the other offer. If you have their best interests at heart, you’ll listen to what they have to say. Candidates know this, and how you respond to news of competition will impact their final decision. There’s always room for improvement, and the more insight you have from your “users” (interviewees), the better. As well as giving feedback, ask for feedback on the recruitment process from everyone who made it to the interview stage. There are lots of ways to gather feedback, including a telephone “debrief”, an online questionnaire, email, or through any external recruiter who might have been involved in finding candidates. An online questionnaire is useful for gathering more structured feedback. You can include questions on specific aspects of the process and techniques used, to pinpoint the areas in need of improvement. Making the feedback anonymous will encourage more honest scores and comments, and you can give candidates the option to include contact details, should they want to discuss anything in more detail. As you may now realise, there’s a lot that goes into interviewing junior software testers, or any potential candidate for that matter. To be successful, preparation is needed before interviews start, and work continues after they take place. There are also various nuances to consider to help junior candidates perform to the best of their abilities during the interview process. Apply the tips and suggestions in this article to your own context to create effective interviews for junior testers, and keep the momentum going to secure the very best candidates. Why not share your own interview and interviewing experiences on The Club? I’d love to hear what tips and suggestions the community has to offer on creating a positive and successful interview experience, as well as any ideas on effective tasks to set junior tester candidates during interviews.